Lake Piuray supplies nearly half of Cusco’s potable water, making it a critical resource for this growing city that is also one of Peru’s most important tourism hubs. There’s something else special about the lake: it is the focus of an innovative agreement between Cusco’s water utility, SEDACUSCO, and rural communities located upstream around the lake. SEDACUSCO has committed a portion of water user tariffs to protecting water quality at its source, by expanding access to rural sanitation in upstream communities and compensating land managers who implement sustainable agriculture and conservation practices. The agreement has increased water security for both rural residents and urban water users, and provided a platform for ongoing dialogue and cooperation. United States Ambassador Urs visits the Piuray-Ccorimarca watershed. Photo: SEDACUSCO. Cusco is a city of nearly 350,000, located high in Peru’s Andean Mountains. It has historically depended on Lake Piuray as its primary freshwater source. Even today, after SEDACUSCO, Cusco’s water utility, has drilled wells to increase access additional water sources, Lake Piuray constitutes approximately half of the city’s potable water supply. Located about 20 miles from Cusco, Lake Piuray is surrounded by a rural catchment area dominated by agriculture. In the late 1990s, demand from SEDACUSCO for water from Lake Piuray intensified thanks to an extended drought and a growing population in Cusco. When agricultural yields began to decline in the areas around the lake, rural communities grew increasingly concerned about water security. Those concerns grew when the drought was followed by floods: the El Niño Southern Oscillation in 1998 was one of the strongest in recorded history, and Peru got 16 times its average rainfall that year. The rains flooded agricultural lands in low-lying areas in the Piuray watershed and triggered a series of landslides that devastated crops. More floods struck rural areas in 2011. Meanwhile, SEDACUSCO noted a disturbing decline in water quality in the lake. In 2011, rural communities and SEDACUSCO began a series of negotiations seeking a solution to the utility’s concerns about water quality and upstream communities’ worries about the impacts of Cusco’s growing demand for water. Shortly after talks began, in 2012, representatives from the Piuray communities were invited to attend an event on an experimental approach being carried out in Moyobamba, a city in northern Peru. In Moyobamba, residents had voted in 2007 to include an additional 1 PEN ($0.33 USD, or a 3.3% increase in the water tariff) in each household’s monthly water bill for a fund for watershed conservation. The money was used to pay for technical assistance and materials for landowners to introduce sustainable agroforestry practices. Inspired, representatives from Piuray communities proposed a similar approach for the Piuray-Ccorimarca watershed. The national regulatory body, SUNASS, became involved and worked with SEDACUSCO to evaluate potential cost savings of working with the rural communities in order to improve water quality at its source in Lake Piuray, instead of building a new treatment plant. In 2013, SUNASS approved a 2% increase in the water tariff charged to water users in Cusco in order to provide compensation to the Piuray communities for helping to safeguard water quality. In Cusco, successive adjustments to the tariff have increased the portion allocated for the initiative to 4%, which has risen several times again over the last five years to 9.6%. More than 80,000 households in Cusco will contribute over PEN 14.6 million (US $4.5 million) to the fund by the end of 2018, making Cusco’s the largest program in the country actively implementing natural infrastructure strategies with upstream communities. In the first five years of the project, SEDACUSCO used the new funds primarily to expand rural sanitation services in the Piuray-Ccorimarca watershed. To date, the utility has spent PEN 4.6 million (US $1.5 million) installing new bathroom modules with full sanitary and electrical services in five communities. The partnership also worked together to attract additional support from the Chinchero Backus-Ferreyros Consortium to finance and implement a wastewater treatment plant, which treats the discharge that these modules collects. These projects have obvious benefits for local residents – 1,913 families to date have been served, several hundred jobs have been created, and SEDACUSCO expects that by 2023, acute diarrheal and skin diseases in the communities around Lake Piuray will be reduced by 80%. But these investments also mean cleaner water flowing to Cusco, 20 kilometers downstream. During the five-year period from 2018 to 2023, SEDACUSCO is shifting its focus slightly, to digging new infiltration canals and replanting forests. The infiltration canals and forests will help to recharge groundwater and filter contaminants. SEDACUSCO also is using proceeds from the tariff to work with local communities to introduce soil conservation practices in farmlands and pastures, and to allow natural vegetation to begin to repopulate degraded grazing lands. The example set in the Piuray-Ccorimarca watershed is a bellwether for the entire country of Peru. A series of regulatory reforms at the national level beginning in 2012 have recognized and promoted the role of water utilities in financing conservation projects. To date, 24 water utilities in Peru have approved tariffs similar to SEDACUSCO’s, including Lima’s water utility, SEDAPAL. As the country’s capital and home to about one-third of its population, Lima is incredibly important for Peru in social, economic, and political terms. SEDAPAL’s 2015-2020 master plan, formally approved in June 2015, includes a 1% tariff increase to be used for ecosystem services (about US $25 million), and an additional 3.8% is allocated for climate change adaptation and disaster risk reduction (about US $105 million). These commitments are by far the greatest commitments for natural infrastructure by any water utility in Latin America. The Lake Piuray watershed is one of the priority geographies under the recently-initiated Natural Infrastructure for Water Security project, funded by USAID and the Government of Canada. The project, led by Forest Trends, will work with the water utility, regional government, and Piuray communities to demonstrate and scale up sustainable investments in nature that enhance water security and resilience. Forest Trends will work with CONDESAN, the Peruvian Society for Environmental Law (SPDA), EcoDecisión, and experts from Imperial College London. 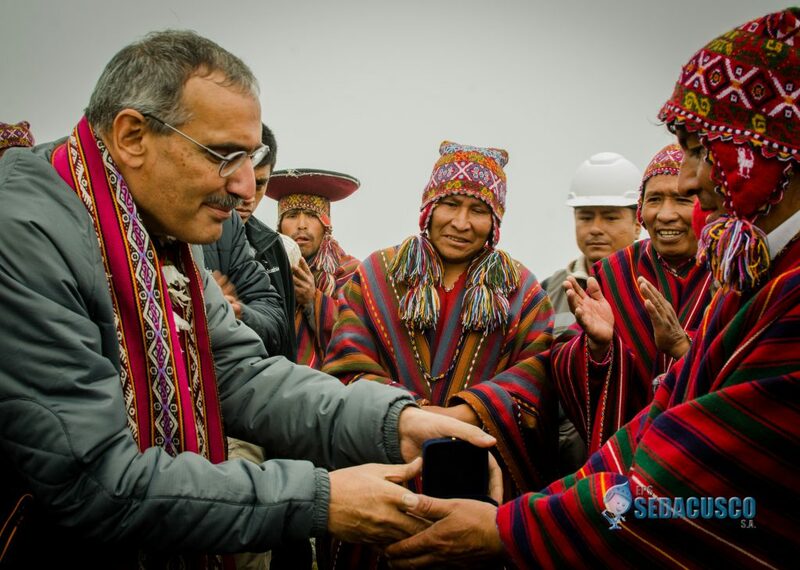 Earlier this year, Forest Trends was honored to work with USAID, SEDACUSCO, and the community of Piuray-Ccorimarca to host United States Ambassador Krishna Urs for a visit to Lake Piuray. Ambassador Urs began his visit with a briefing at the offices of SEDACUSCO. From there, the Ambassador travelled to Lake Piuray, where he met with community representatives to learn the community’s perspective on the agreement and visited a natural infrastructure project site.